Hodgen, Herbert Clarke (Clarke). 4th December 2018 peacefully at hospital. Dearly loved husband of Sally and much loved dad of Patricia and Angela and grandad of Sarah-Jane and Andrew and great-grandad of Freddie. Service in S. Clarke & Son’s Funeral Church, Newtownards on Tuesday at 11.00a.m. Funeral afterwards to Clandeboye Cemetery. Family flowers only please. 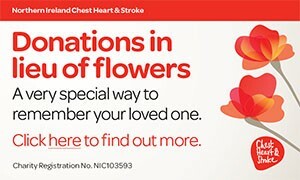 Donations may be sent if desired to The George Cross Foundation or Alzheimer’s Society c/o S. Clarke & Son Funeral Directors, 12 Court Square, Newtownards, BT23 7NY. Lovingly remembered and sadly missed by the entire family. Deeply regretted by his sister-in-law Audrey and family. Our thoughts are with my sister and family. I am sorry to tell you that Herbert Clarke (Clarke) Hodgen has passed away.